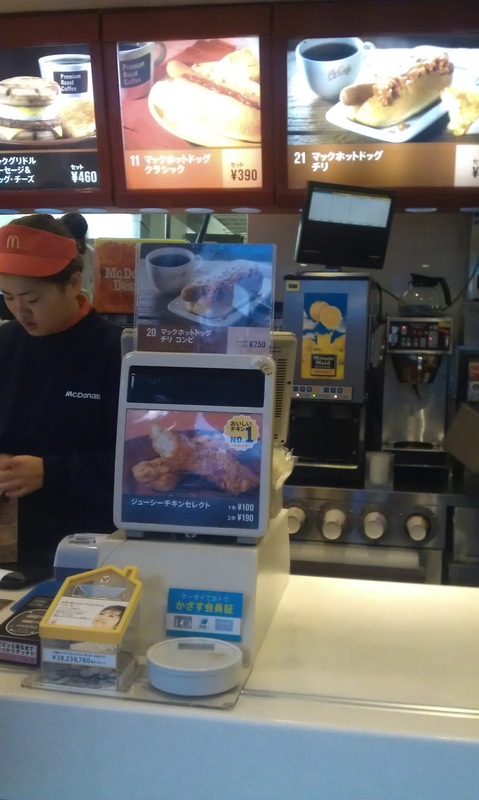 McDonald's Japan has a great website, and my last few trips to Japan I have actually visited their website prior, in order to check which limited edition item I can try. They also have printable coupons that change every few weeks which can help minimise the damage to the wallet. 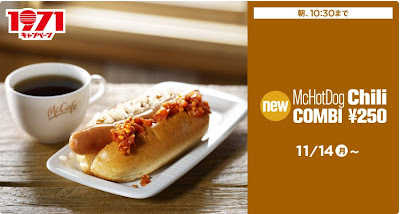 A few days before my arrival they announced the Chilli McHotdog combo for just 250Y, as a part of their 1971 throwback promotion. A McHotdog is an item I tried on an earlier trip to Japan, and is a regular breakfast menu item (full review will come one day). This chilli version is a one-month limited edition promo. The 'combi' did not include a hash brown, but that was perfect for me at the time, as I had a 5am arrival at Haneda airport after a red-eye from Singapore, so I wasn't very hungry and didn't need the oil so early in the morning. A standard McHotdog combo with a hash brown was still being offered, but I don't know why you would order it, as it was still 390Y, and a hash brown on its own is only 100Y so you'd save money by ordering them separately. The Chilli in the promotional photos online, and on the posters inside the restaurant looked pretty good. 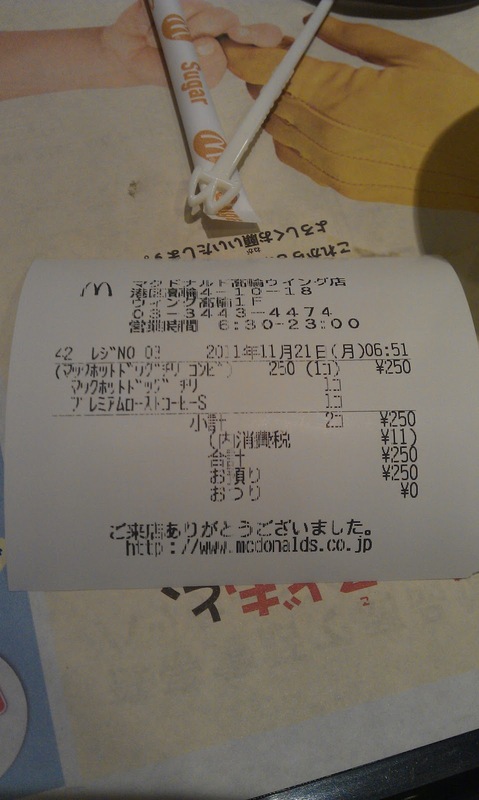 The last time I had Chilli on an item in Japanese McDonald's (look for that review soon) it was very good, and rather hearty, so I worried how heavy chilli would work for breakfast. 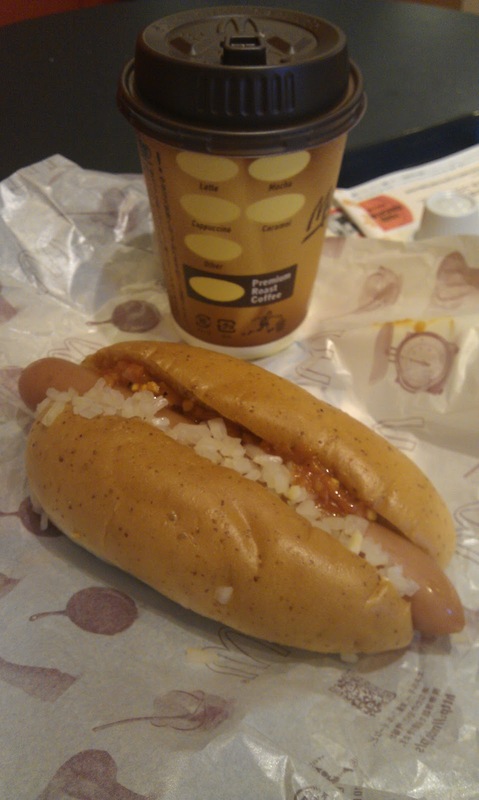 But, not surprisingly, the chilli on the McHotdog wasn't the same, and there wasn't very much of it at all. Instead of the ketchup, mustard and relish on the standard dog, all three have been replaced by the chilli & onion mixture. It was flavourful, but personally, I think it needed about 3X more to be sufficient. The lack of chilli allowed me to taste the garlic spiced bun (which is same as the regular McHotdog) and let me notice the texture of the hotdog itself. I've only had a few in Asia over the last 6 years, but usually the skin on a hotdog here is much tougher and chewier than a western dog. This hotdog tasted exactly like a western one, albeit with a lightly denser filling, not sure if this is a Japanese thing, or just McDonald's Japan attempting to be westernised. I didn't see anyone else ordering the chilli hot dog, and as it was the last 4 days of this promotional item, I guess the Japanese didn't really enjoy it. A small note about this branch. 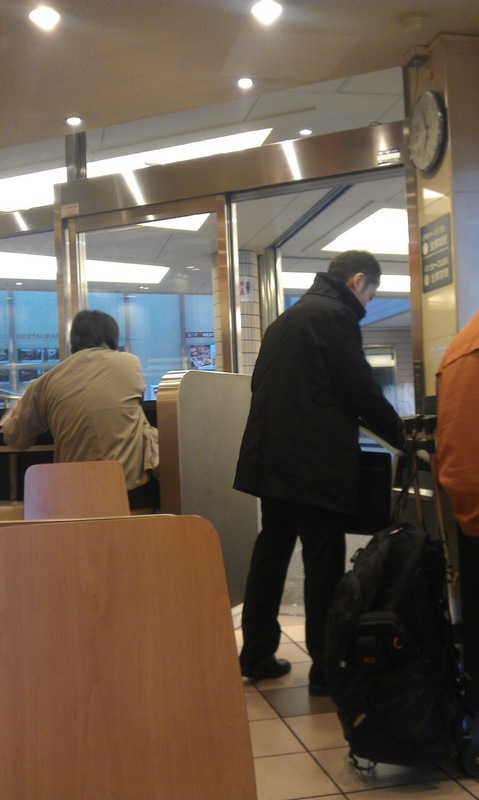 Normally the full size McD's in Japan have a full smoking section (or floor), but this on was next to a busy train station (Shinagawa Stn) and only had about 30 seats. 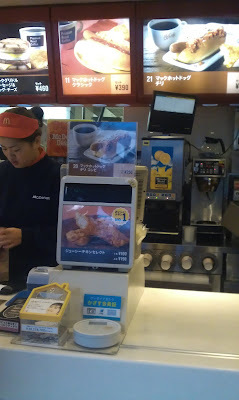 Many Japanese McD's near stations have their ordering wall's outside the dining area acting as it's store-front, so people can get their food and make their way to the trains quickly without even entering the restaurant. I commenter asked me to take a photo of the store front, and I will from now on, but now, you can see it on through Google Street View - here. In this case, the dining area was slightly around the corner from where you ordered. Strangely, it was entirely smoking from 5am-10:30am (breakfast hours), when it was lunch, it turned to non-smoking. All 25-30 people sitting there were chain smoking, and as soon as I walked inside my eyes really felt the smoke. I saw a few others walk in with their tray notice all the smoke, then walk quickly out and get it for takeaway.